Baba au Rhum is a delicious, rum-soaked yeast cake full of flavor (and booze!) and great for any occasion or holiday party! Most people would think of yeast when it comes to cake. Hopefully this cake will change your mind. It is absolutely delicious, and you get a lot of rum! Baba au Rhums are usually made in individual servings, but I decided to make it as my bundt cake this month. Don’t forget to enter in my Red Star Yeast Bread-Baking Giveaway at the end of the post. There are some awesome goodies in the prize package! Sometimes fruit is added, like currants or rum-soaked raisins. I decided to not add fruit, but instead add vanilla bean paste. Vanilla is one of my favorite flavors and I loved the addition of it in this cake. Seeing all the little flecks of vanilla seeds makes it extra special. Vanilla also pairs great with rum. I used the darkest rum I had, which I think makes all the difference. When making the syrup, you might think it is too much, but believe me, the cake will soak it up. 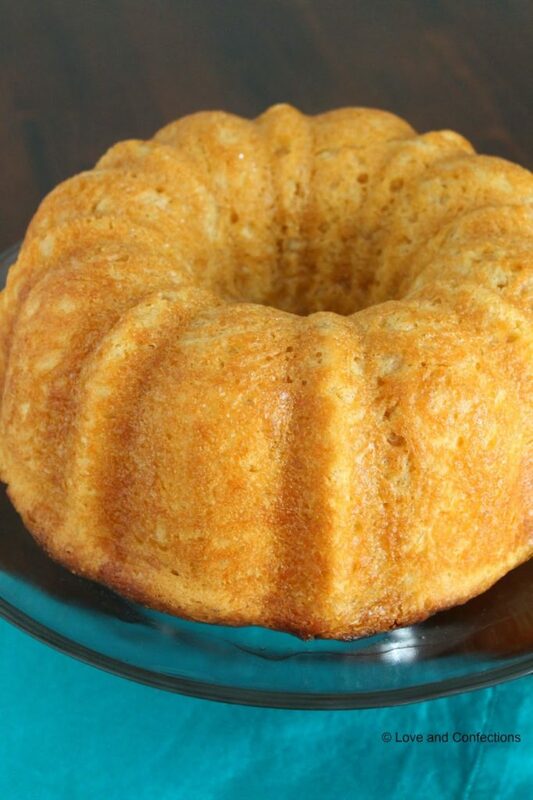 You can use less syrup if you want, because the rum in this cake definitely gives it a kick. It was quite fun making a yeast cake as opposed to a cake with regular leavening agents. After the first rise, the cake was about halfway up my pan. When I checked on it after the second rise I was so happy because the cake was all the way to the top. It really is fun working with yeast and watching it happen right before your eyes. 1. In the bowl of your stand mixer fitted with the paddle attachment, add 1 & 3/4 cups of the Flour and all of the Yeast, and blend briefly to incorporate. 2. In a medium saucepan, heat the Water, Milk, Butter, first measure of Sugar and Salt, while continuously stirring, to 120F-130F. The temperature is important so as not to kill the yeast. Please make sure you have a working and calibrated thermometer. 3. Pour the liquid into the flour, then add the 4 Eggs. Mix on low for 30 seconds, scrape down the sides, then mix on high for 3 minutes. Add in the remaining flour and mix on low to combine. 4. Take out the paddle and cover the bowl with plastic wrap. Let it rise about 30-45 minutes or until it has doubled in volume. 5. Use baking spray to grease the insides of a bundt pan. Once the cake has doubled, pour it into the bundt pan, spreading it out evenly, and covering with plastic wrap that has been sprayed with baking spray. Let it rise a second time for about 30-45 minutes or until it has doubles once again in volume. 6. Near the end of the second rise, heat the oven to 350 degrees. One thing to note, make sure you use the lowest rack in your oven so the top of the cake does not burn. Bake the cake for 25-35 minutes or until it is golden brown and a cake tester comes out clean. If you need to, you can cover the top with foil after 20 minutes of baking if it starts to brown too much. 7. During the last few minutes of baking, make the rum simple syrup. In a small saucepan, heat the Rum and Sugar until the sugar completely dissolves, stirring frequently. Pour the syrup into a measuring cup with a spout then add the Vanilla Extract and stir. 8. Poke the bottom of the cake with a skewer, then turn the cake out onto a stand or plate and pike the entire top and sides of the cake also with a skewer. Very slowly, pour the rum syrup over the cake, making sure it soaks in. If the syrup pools, let the cake soak it up before serving. 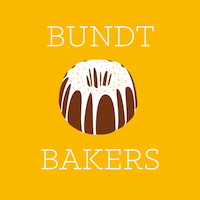 Don’t forget to check out all of the wonderful Boozy Bundt Cakes this month! I love making cinnamon rolls! Any yeast bread is fun to make because it feels like such an accomplishment! It is an accomplishment and great when you get to eat all your hard work! Great choice for this month. Thanks! It definitely fits the bill when it comes to booze! I've never made a baba au rhum before but this cake has me wanting to try it! It looks so moist and delicious! Yum! And very boozy! Thanks and you should try it! Dear Terri, I love baba au rhum. What a great choice. This sounds so good and looks beautiful. Bread making is very therapeutic. I used to joke that if you were angry go bake bread and take it out on the dough. I have VERY fond memories of baba au rhum. I ate after my senior prom which was a wonderful occasion. I had forgotten about it for a long time. It was wonderful to see it. Thank you. Sigh. If I am using yeast, I am making cinnamon rolls. You're right, seeing your dough rise can be very rewarding yet also heart pounding in the meantime. 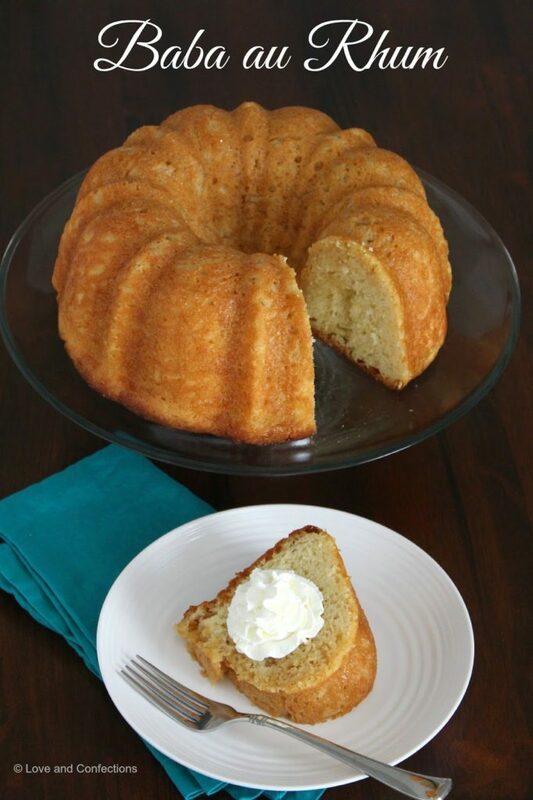 Great bundt this month! Love this different holiday cakes. Love a great rum cake and this looks so good!! 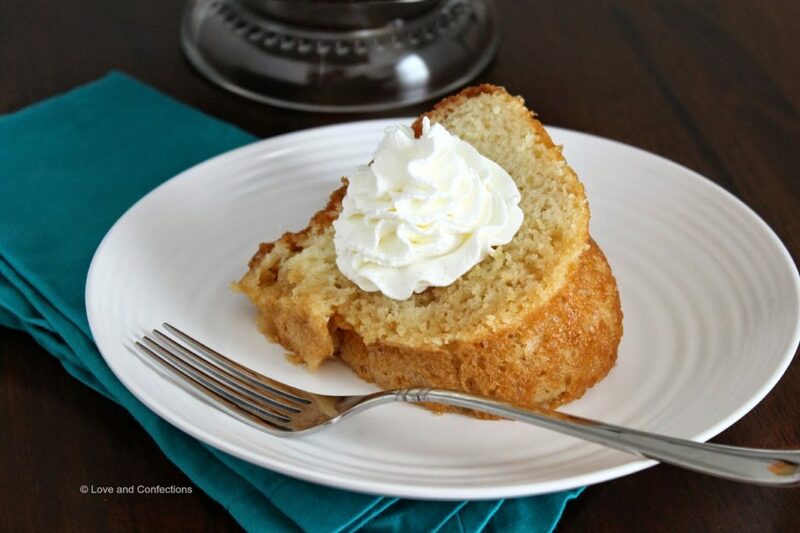 I love rum baba, Terri, and your idea of baking those flavors into a yeast cake Bundt is brilliant. I haven't made one of these in AGES. Thanks for the reminder. I think I would like it better without the fruit. Just the rum and vanilla sounds fantastic!! I love rum and vanilla together, they go perfectly! I love that you've paired vanilla with the rum, I can only imagine how delicious this cake must be. It was good – and so boozy! Lovely Bundt!! I would like to taste it!!! Really good with the rhum! 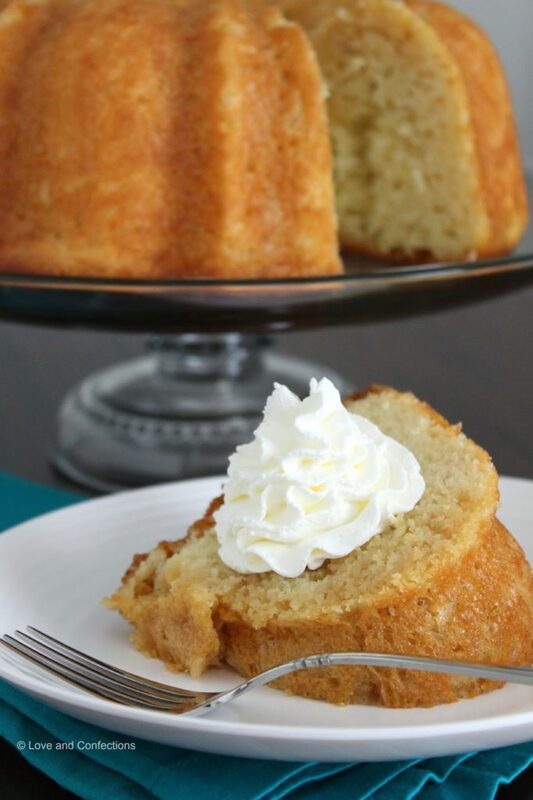 Beautiful bundt cake and it sounds amazing! I first made a baba au rhum recently. Sooo good. I have always wanted to make baba au rhum. Love the idea of making one cake instead of several.